Yvonne - I had to go back to Twiggy & Toots Festive Fun - as the characters are too adorable to ignore. For this card, I made a 7x7 card using a 'scene' from the main collection. I then resized the matching image and cut it out to decoupage. Monica.- For this week I´m trying out a mix of two different folded cards: a diamond card + a gatefold card. 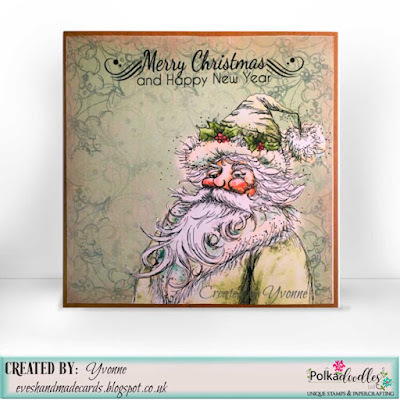 I used the stunning papers included in Winnie Winterland Collection, As well as a gorgeous poinsettia and the adorable Winnie Angel precoloured image. 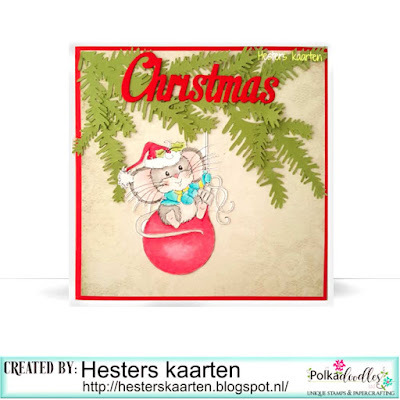 Julie - I have made a fairly CAS Christmas card this week, using an image from Winnie Winterland. 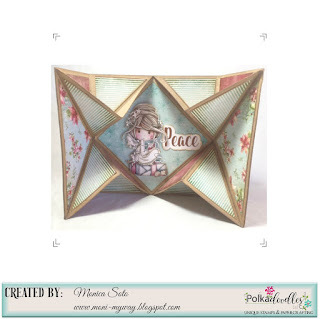 Katrina ~ The beautiful papers in Winnie in Winterland lend themselves to a beautiful mixed media look without the mess! I did add a few elements/ideas you can read about on my blog. 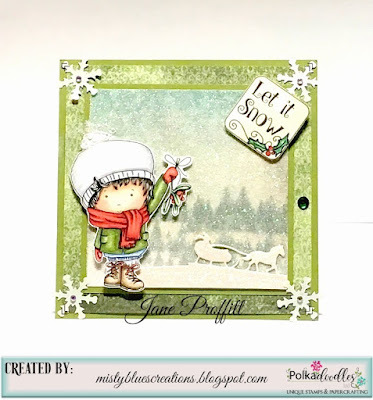 Paper, sentiment and pre-colored digi are from Winnie in Winterland. Anjie - I used the Octavia Frosted Winter collection. I love the colours in this collection as that's what colour Christmas is in out house. My tree and decorations are all in these lovely blues and purples with some pink in there as well. I used 4 different papers cut into squares, the edges distressed with ink and faux stitching added around the edges with a white pen. They are then matted onto a tag die cut. All the embellies are then fussy cut and mounted on using 3D foam to make them pop. The sentiment is from Christmas Tree Script stamp set from Polkadoodles. More info and close up pics on my blog. Hester: This time I used Hot Chocolate - Octavia Frosted Winter . I love all Octavia Frosted Winter images, they are so gorgeous. What you do not see Clearly visible on picture is that I use glitter and sparkle. Andrea: My card for this challenge is made with the beautiful Twiggy and Toot Festival Fun Kit. 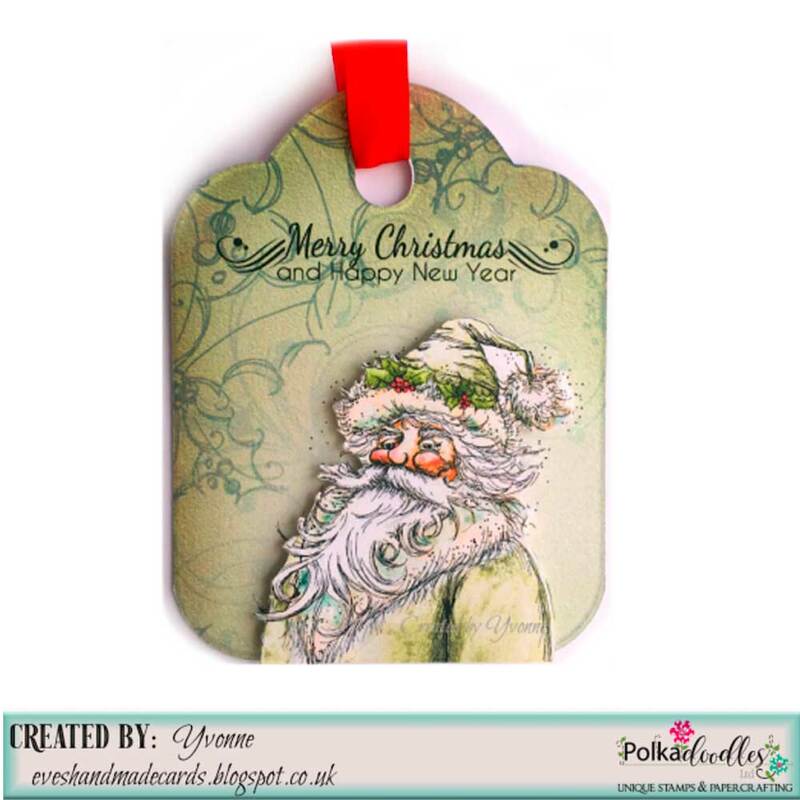 I have used a Christmas Die Cut and added my image into the middle. 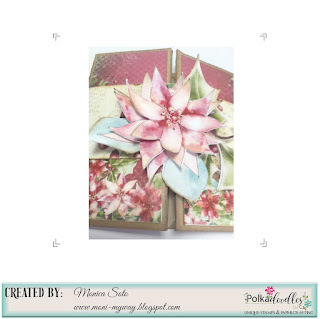 The inside of my card I have decorated with some more elements from this lovely Kit. Jane S - Nikky has a fabulous new line in fabrics and clothing in the store (check them out here) so I thought I would use a die to create some Christmas jumpers using the super cute Baked With Love Collection and one of the fab clear stamp sentiments from the Gifts & Stockings Set. 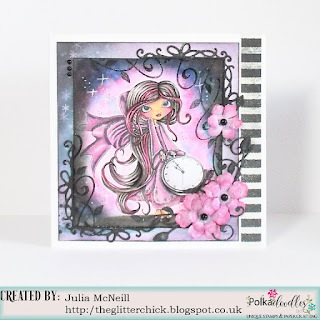 Julia I have had a play with one of my Favourite Collections, Octavia Frosted Winter I coloured in the Winter Time Digi with my copic markers. 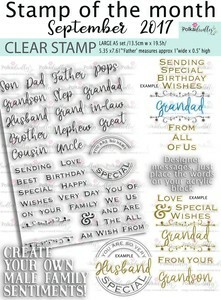 I have teamed it up with papers from the same collection. 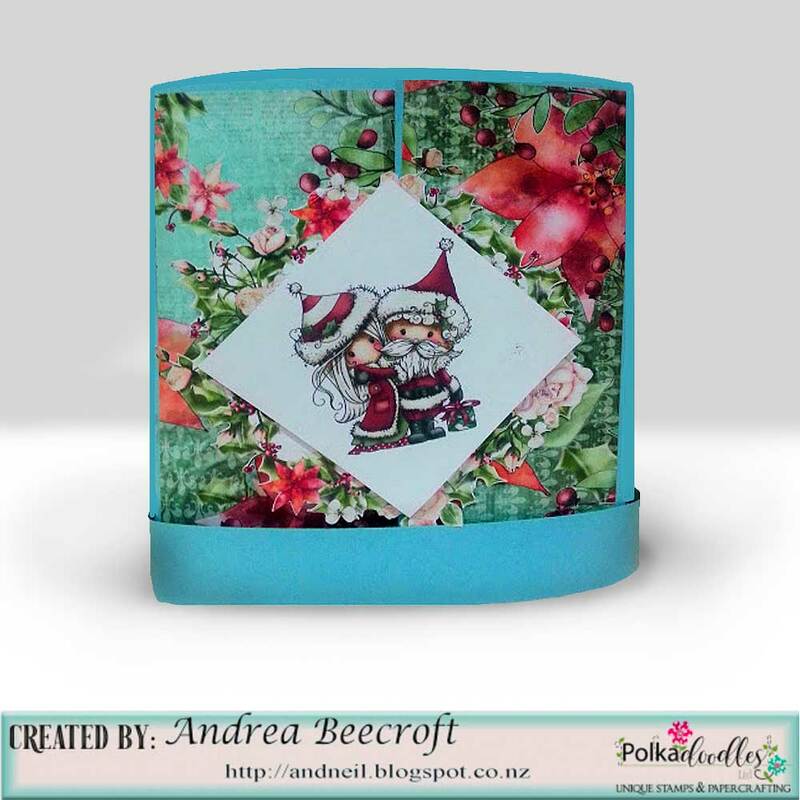 I also used a stamp from the Belle Papillion to decorate the edge. 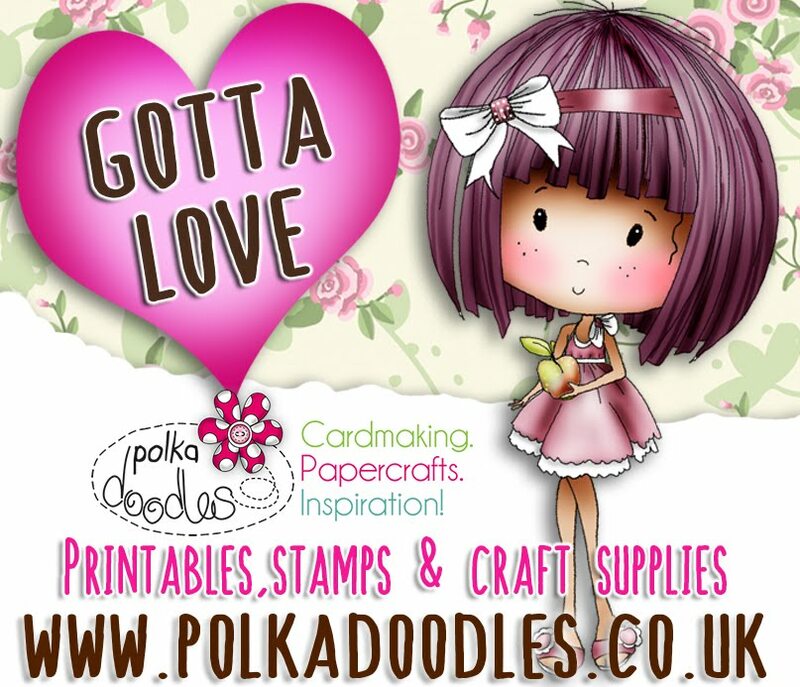 I have embellished using some fab Polkadoodles dies. Jane P- Went a bit to the non traditional side of Christmas this week using Be a Unicorn from the Ula Collection. Željka-Hello!! 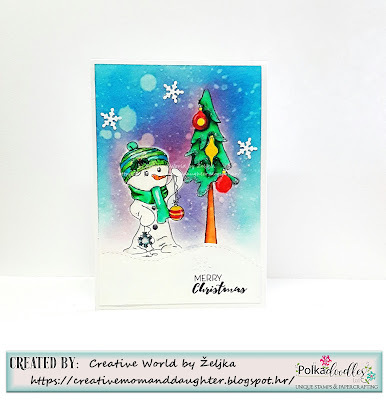 !I love get inky so for this challenge I decide to create a winter night scene and use few images from Winnie Winterland collection...Snowman,the tree and ornaments.I colored them all with my ZIG markers and background I was inked. Claims must be received by 8/10/17, please refer to Challenge rules at top of blog. 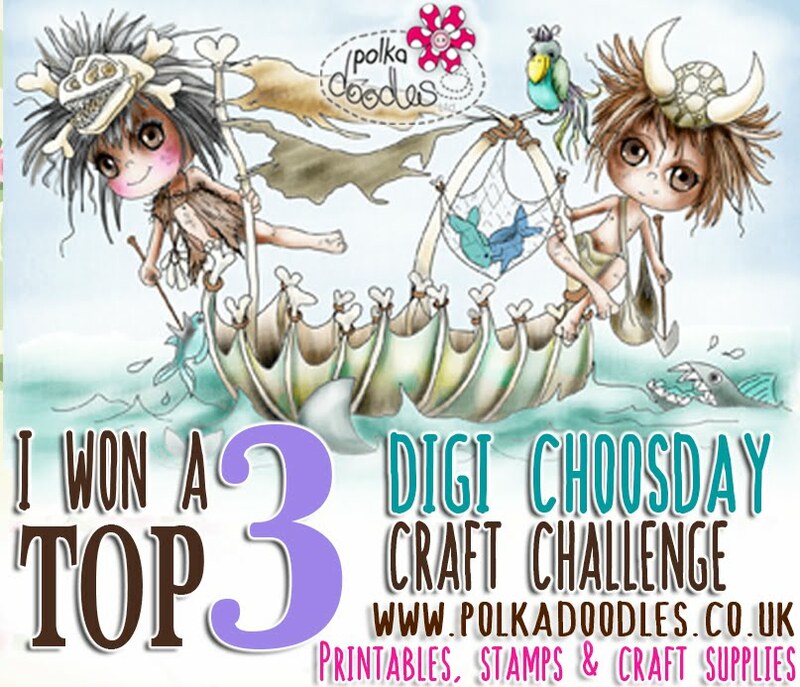 Please email us sales@polkadoodles.co.uk quoting DCW350001 to claim your prize of 3 digi images from the digi store! 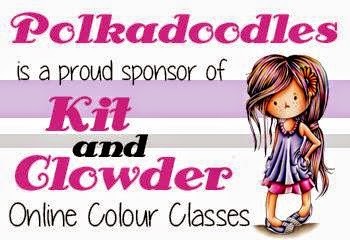 Do you follow our Polkadoodles challenge each Friday? Yvonne - Everything I have used, the tags, the images and the sentiments are all within the Helga Collection which you can get in one bundle - here. You can get the tags in this bundle here if you want them by themselves and the sentiments in this bundle here. 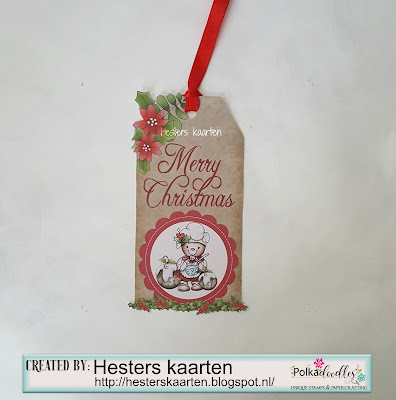 Hester - I made this tag from Bakes with love collection. I used Design Sheet, Tag and Foliage. 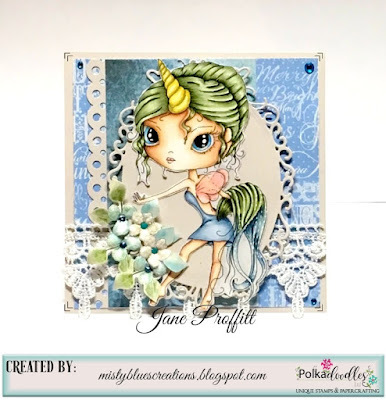 Jane P- Discovered a new collection to use for this weeks tag and I am in love. The Eden Collection. Image colored with Copics. 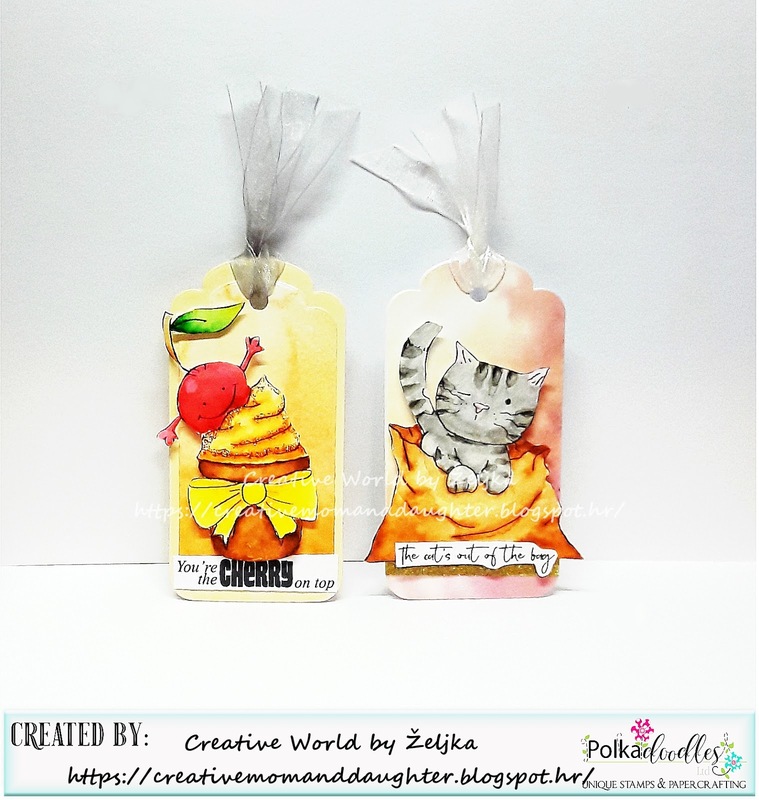 Julie - It is my first time using Lil Miss Sugarpops, I have made two tags and used them as card toppers. Monica.-Every Christmas I run out of tags, they are never enough. I think everybody has the same problem. So for this challenge, I made a little gift box full of tags. I think this a very useful gift. 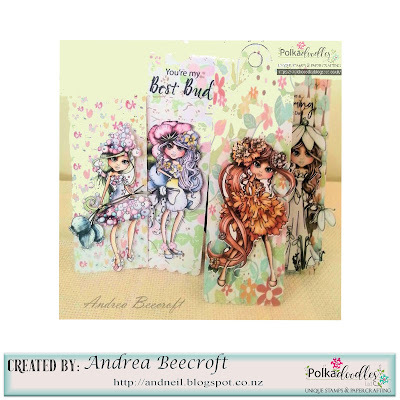 I used papers, borders, sentiment, precoloured images, toppers and premade tags from Baked with Love Gingerbread. Željka-Hello!! 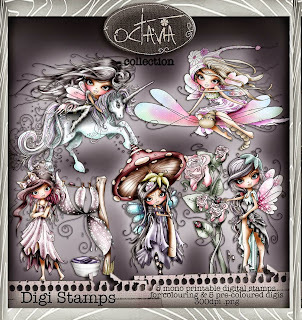 !For this week "Tags" challenge I use almost half of Too Cute collection.When I started I just couldn't stop to play. 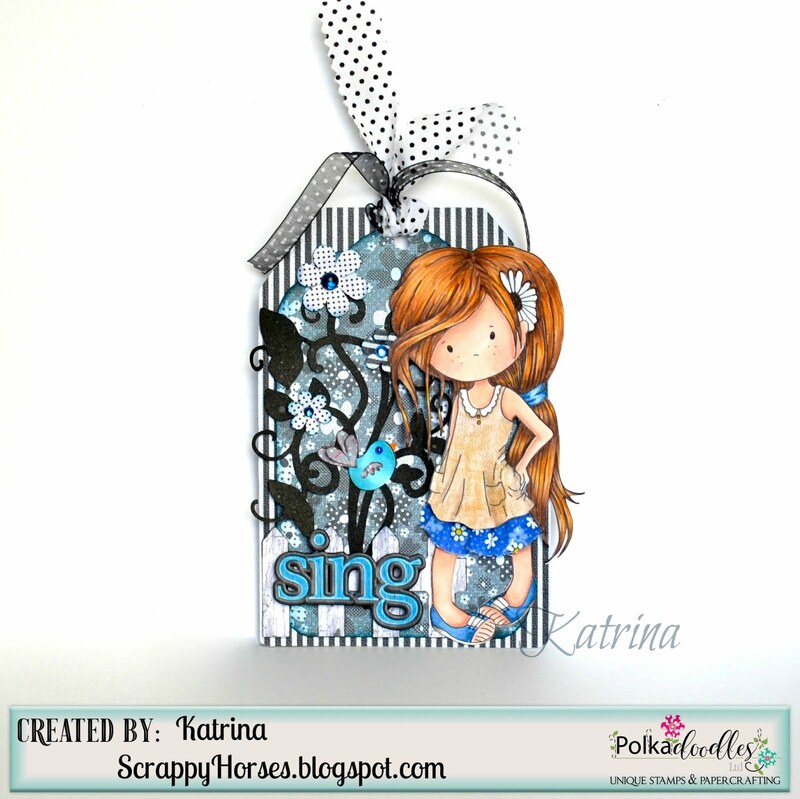 Katrina ~ I chose several pieces from different collections for my tag today! 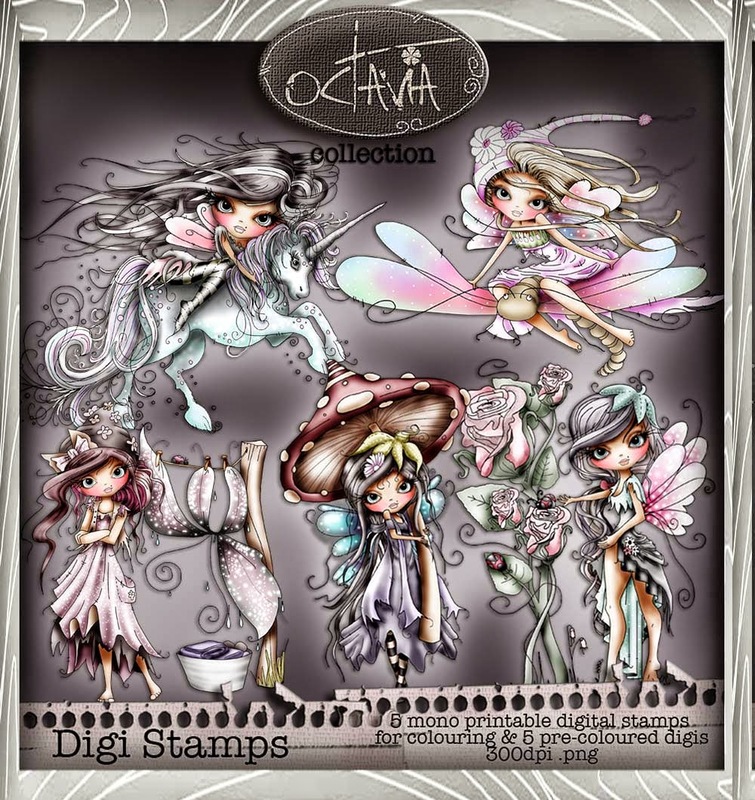 This cutie girl is Luna a digital stamp; she is listening to the little bird from Bird Frames SVG Cutting File. The flower vine is Flowers 2 Cutting File. All papers are from Octavia Moonfly Paper Heaven 5 and Paper Heaven 4. 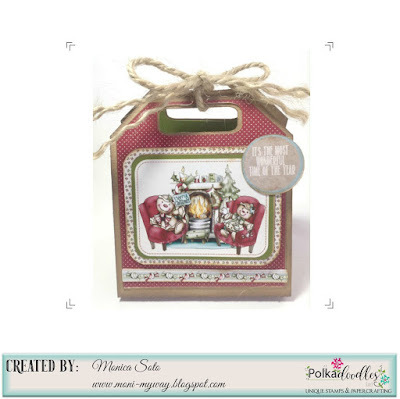 The fence is cut from Winnie Special Moments -Embellishments on Distressed Wood paper. 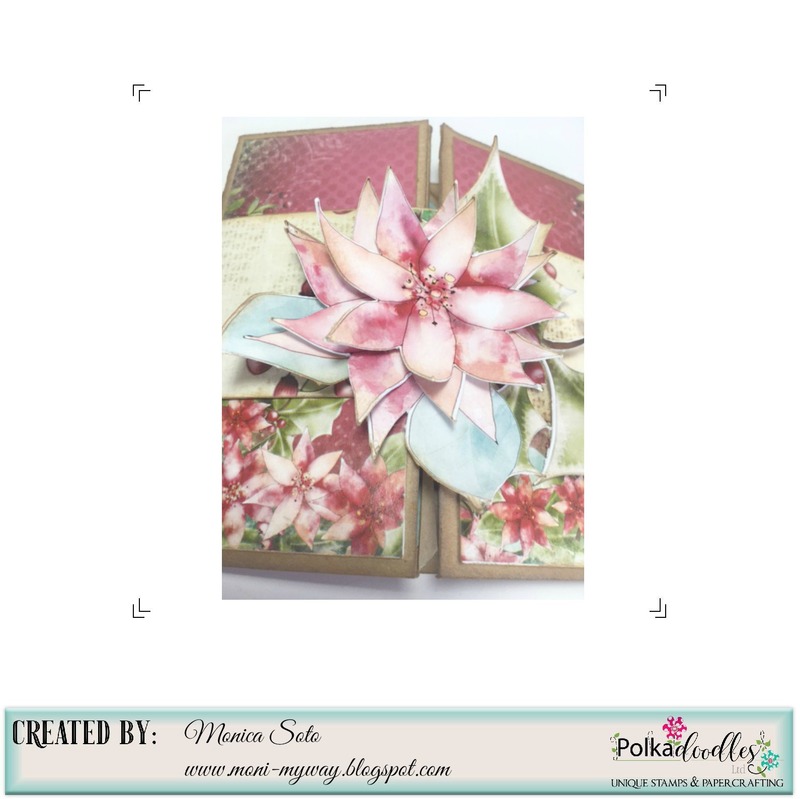 The flowers are from the Work & Play Collection 12 and the sentiment is from Work & Play 8. 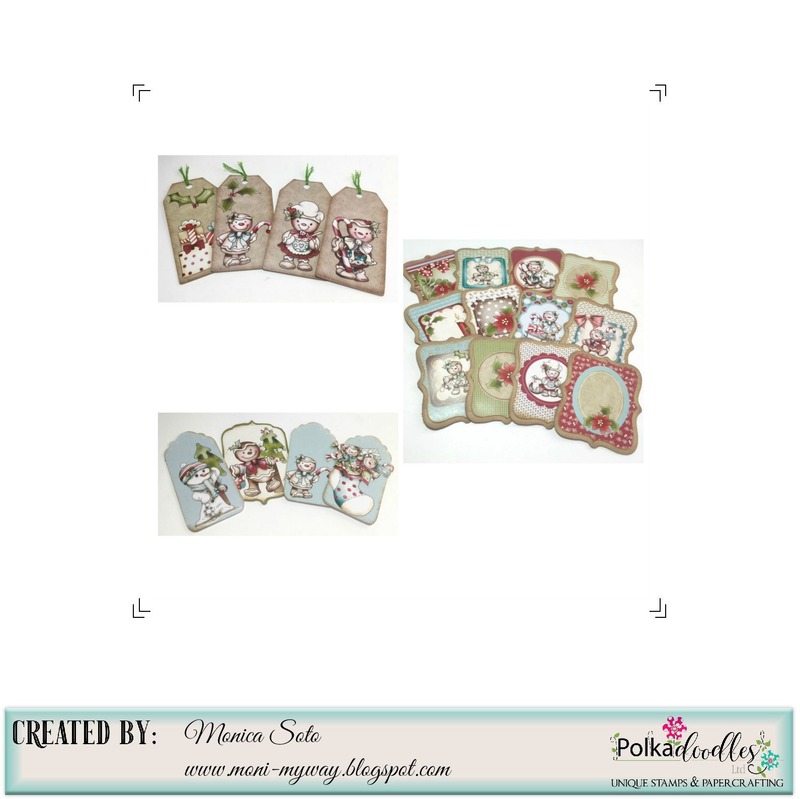 Finally, the tag cuts are from Winnie Sugar Sprinkles and Winnie in Wonderland. Jane S - I have used one of the fabulous Christmas sentiment stamps, stamped directly to digi paper adding pre-coloured images shrunk to about 3cm high to 'sit' upon it! These are all from the stunning Winnie Winterland Collection. 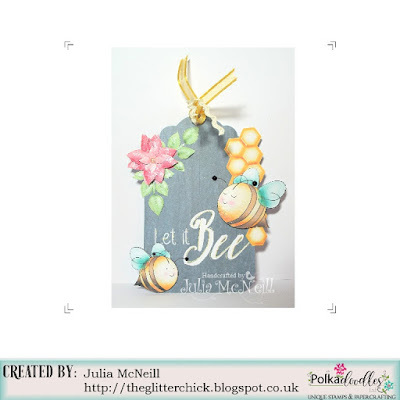 Anjie - To make this I've used the Octavia Frosted Winter collection. I used 4 different papers cut into squares, the edges distressed with ink and faux stitching added around the edges with a white pen. They are then matted onto a tag die cut. I have then fussy cut at the embellies and the fabulous unicorn and added some glimmer using a Wink Of Stella pen on the main of the Unicorn. Lots more details and close up pics on my blog. Claims must be received by 1/9/17, please refer to Challenge rules at top of blog. 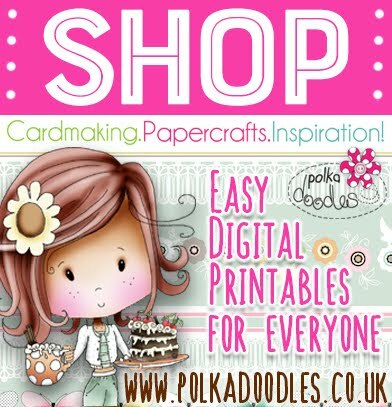 Please email us sales@polkadoodles.co.uk quoting DCW340001 to claim your prize of 3 digi images from the digi store! 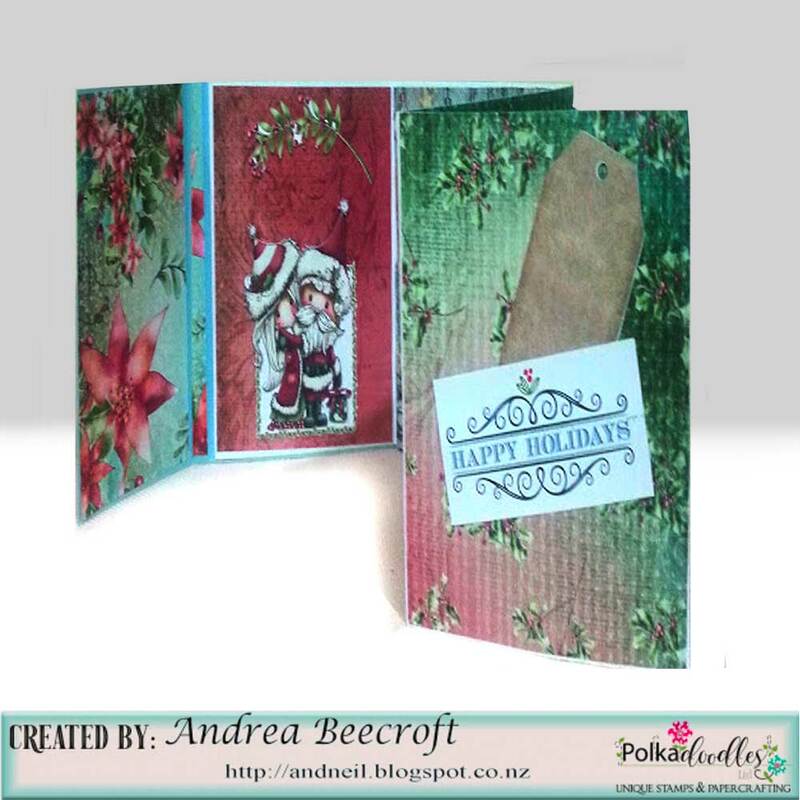 Andrea: My card for this challenge is a folded card decorated on both sides of the fold out, I also added small pockets where I placed tags in each pocket - theme being "Christmas or Winter Colours" I have used the lovely. "Winnie in Winterland Kit." Yvonne - Hello! This time I am here to showcase some of the wonderful collection Picknix Nordic Winter. 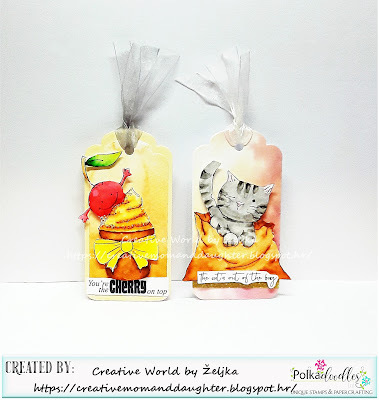 I made a matching card and tag. 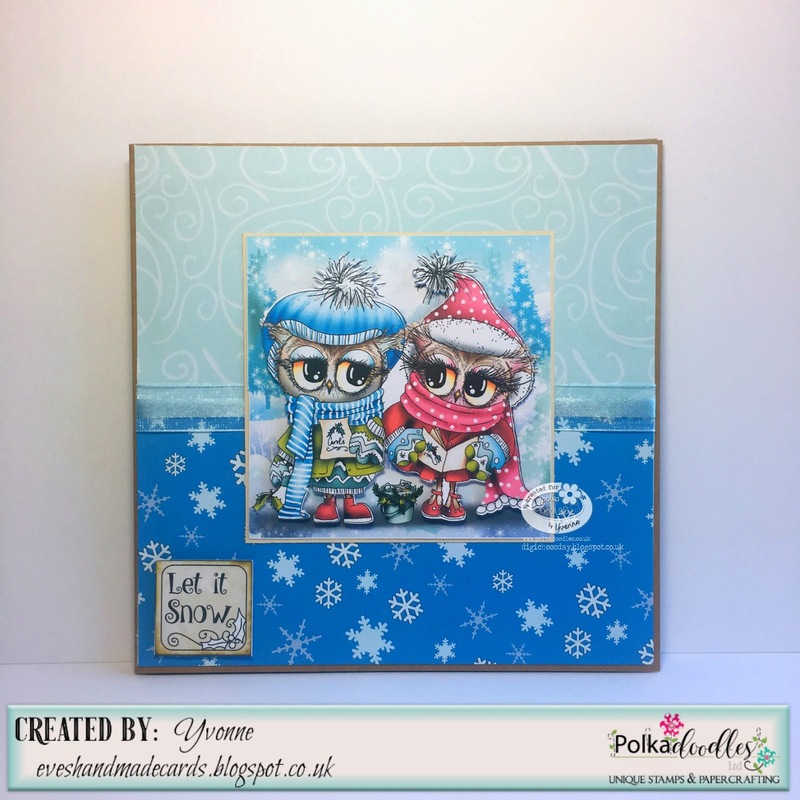 Julie - I have used one of the beautiful images from Winnie Winterland, which I have coloured up with Copics and created a little scene around her. Anjie - I've used the Work and Play 5, Festive Hollybobs collection to make this. It's still a great collection to use as it hasn't aged at all. 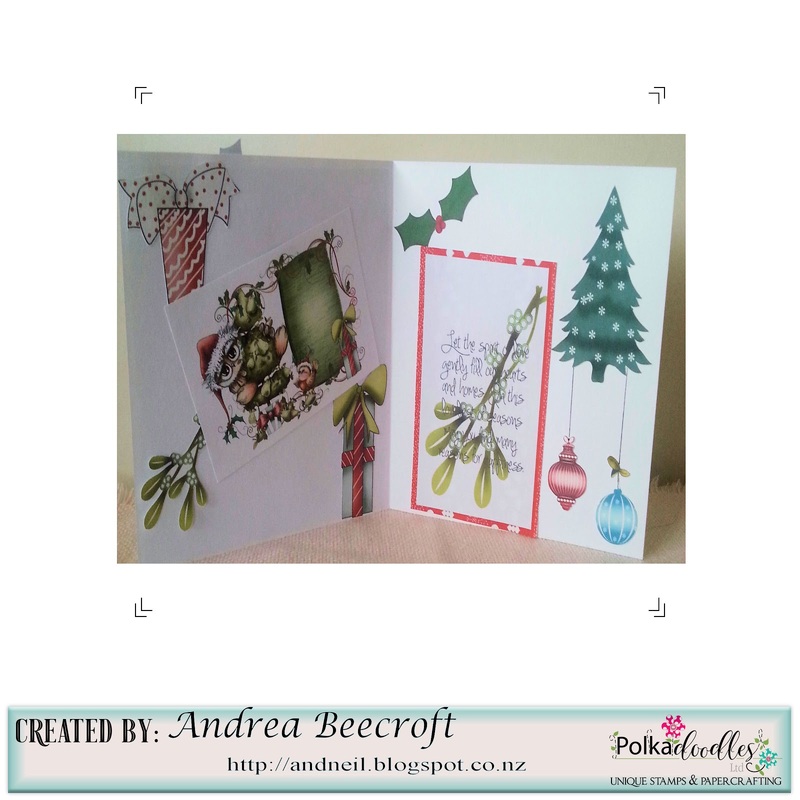 I've used one of the design sheets, a piece of red card and a white card blank to make my card. More info on my blog. Monica.-Recently I watched a tutorial for a spinner easel card and I wanted to give it a try with a Christmas card. Twiggy & Toots Festive Fun Collection was just perfect for that. 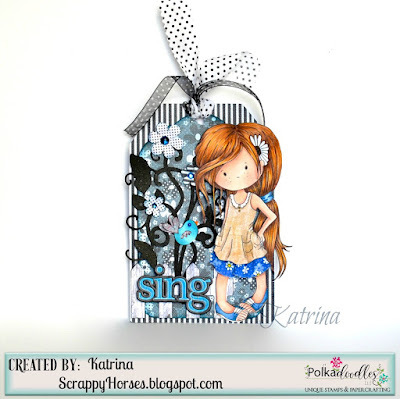 Katrina ~ Today I decided to try something I've not done before; I made a Bendi-Card from different patterns and mixed watercolor, copics, and lots more! Paper, sentiment and digis are from Winnie in Winterland. Jane P- It has been fairly warm here in PA. as of late and I wanted to make a card to "cool" off!" 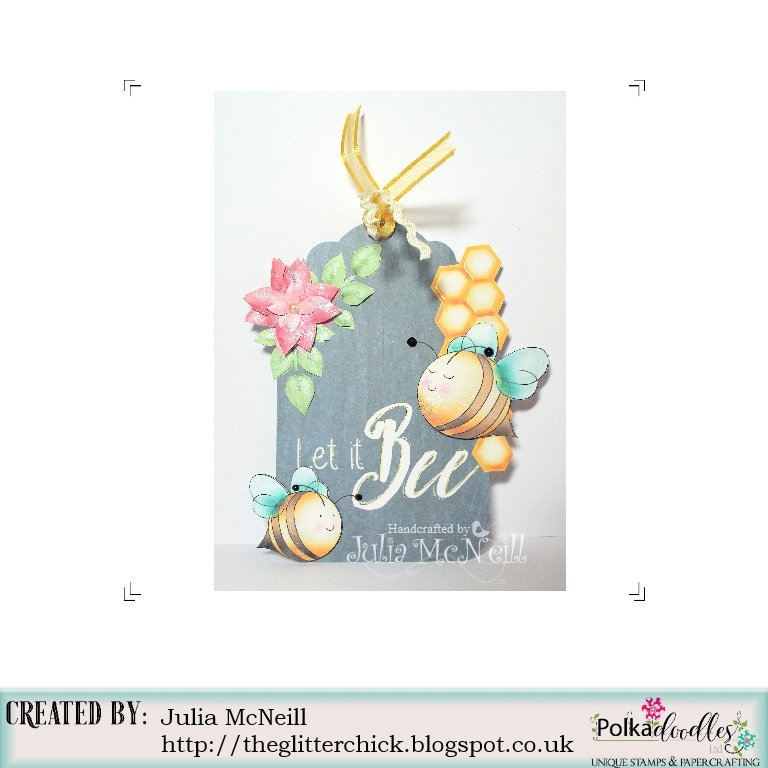 Lots of glitter to imitate snow and a lovely image from the Work & Play 5-Festive Hollybobs Collection. 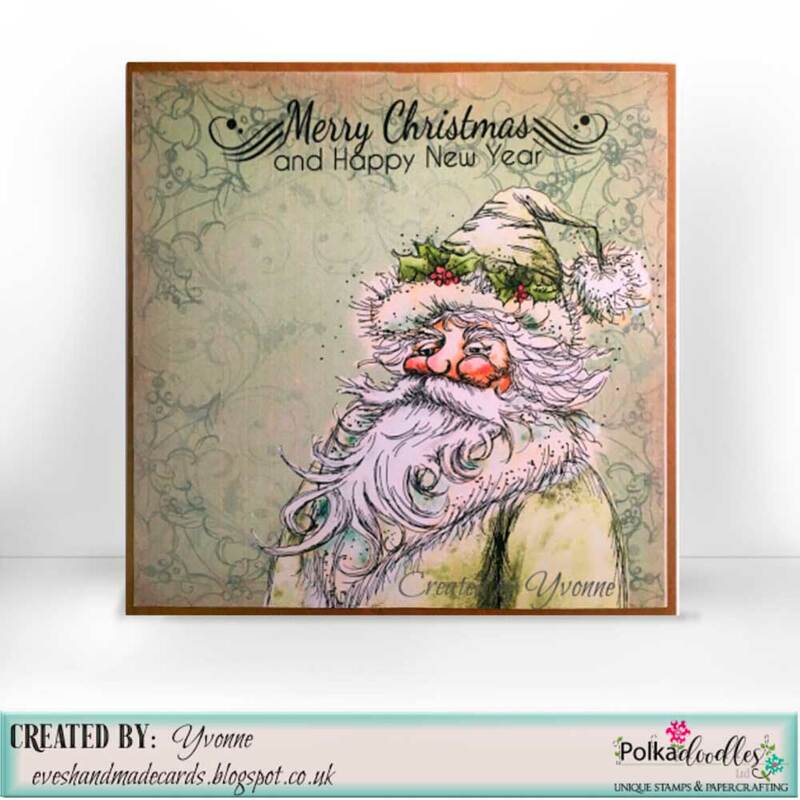 Jane S - Ok so it's a little early for a countdown (and don't panic there are not 24 sleeps to go) but I have created a countdown calendar using the gorgeous Festive Christmas Collection. Claims must be received by 25/8/17, please refer to Challenge rules at top of blog. 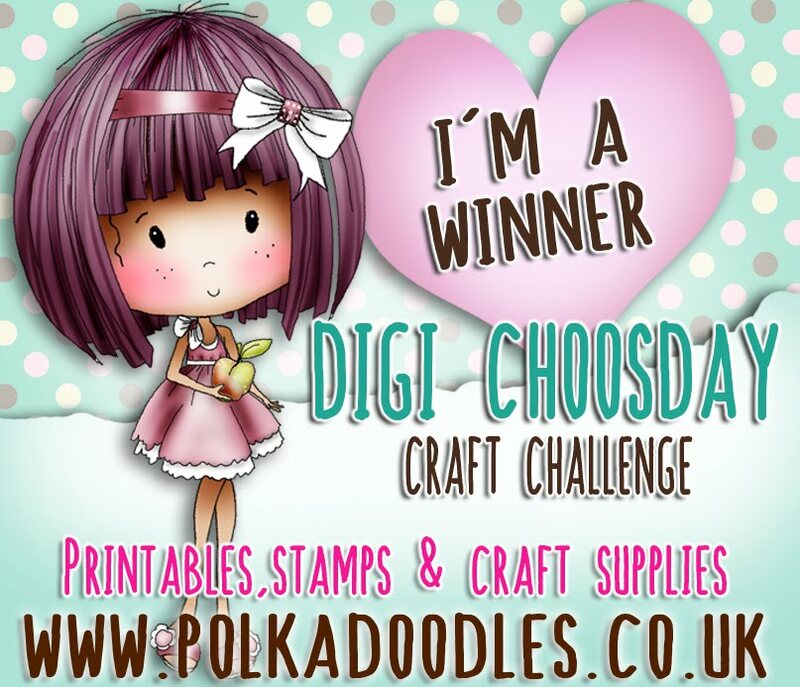 Please email us sales@polkadoodles.co.uk quoting DCW330001 to claim your prize of 3 digi images from the digi store!